Horay for Charlie and Tonii… The Boys from the Other Side of the Hill! It was a night of stand-up with little-known interesting history as the OBHS Presented on June 16, 2011 Charlie & Tonii… The Boys from the Other Side of the Hill! As boys Charlie Carlos Charlie LeGretti) and Tonii (Larry Tonnii DeGarcia) lived in Sunset Cliffs Azure Vistas project housing, which is now considered prime ocean front property. Also, they had both lived in the Frontier projects where the old Frontier Drive-in was located in the Midway area (now called North Bay). Charlies’ (nick-named Taco), family owned the first Mexican restaurant in Ocean Beach. Wonderland fascinated Tonii DeGarcia (Gar) and played a major role in his life. The original Wonderland Offices, which were moved and converted into apartments, were his first home. Many years later when the building was condemned, he bought it and restored it. He also commissioned several Wonderland paintings he showed at our program. 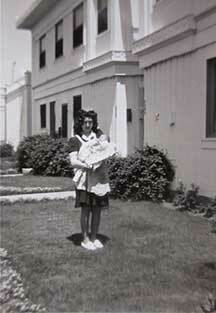 Tonii DeGarcia as baby in front of Wonderland Apartments.